A Top Hat representative will be on the Manhattan campus Wednesday, Sept. 12. Instructors who would like to meet with Jay Meloff and discuss using Top Hat for their courses should send Jay an email (jay.meloff@tophat.com) to schedule an individual meeting. 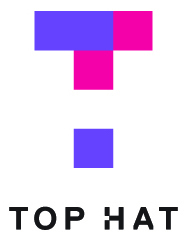 Top Hat Classroom is a student engagement system that allows you to ask questions, take polls, give quizzes, and receive feedback from your students during class. This is a bring-your-own-device solution, which means that students can use any web-enabled devices (laptops, tablets, smartphones) to participate. With Top Hat, answers can be submitted via text messaging, so students can use older cellphones as well. With Top Hat Test, instructors can easily administer and grade exams, monitor behavioral patterns, and utilize lock-out capabilities. To learn more, visit tophat.com.